Pinterest has made the announcement that it is making many changes in the way it functions. Good news for companies as it is allowing them to set up their business accounts which would prove to be very helpful to them. To top that, it is also on the verge of releasing terms of service that are solely meant for business purpose. This segment is totally removed from the TOS that is used side by side. These accounts that are business specific have been welcomed warmly by companies as these are proving to be helpful in carrying out many tasks. If one has a personal account on Pinterest, it can be easily converted to business specific accounts for business use only. As already known, Pinterest is a meeting ground for ideas and innovations. Millions of people share this platform and have a personal account on Pinterest. This leads to exchange of ideas and innovations. The people at this social network give great ideas, inspirations and content to the people who have given shape to Pinterest. Hence, there is global sharing of fascinating facts from one side of the world, innovative collections from the other and tasty recipe from the other part of the globe. This has given inspiration to many Pinterest users to carry forward these ideas and mould them into thriving business. It is sine qua non that personal Pinterest accounts are getting converted into business accounts and how. Millions of users across the globe are getting new business ideas and are opting for Pinterest business accounts. If you are convinced too but have no clue how to go about it then you must read on to get enlightened on every aspect of business specific Pinterest accounts. It might be starting your Pinterest account right from the scratch or it can also be about converting your personal account into a business specific one. It’s one and the same thing here. For one, you must remember that the look of your business specific Pinterest page will be similar to that of your personal account. Another appealing fact is that this conversion of your personal account into business one does not take hours to happen In fact, this takes just a few seconds. Though you might take some time for pinning images and setting up your board, the main process of setting up your business specific account will not take more than a few seconds. One can wonder that if business and personal accounts do not differ much, why bother about converting them? There are a few reasons for doing that. Firstly, the news about Pinterest setting up business accounts has spread far and wide. Hence, if you wish to receive the educational content from Pinterest about making your business a success then you will have to get you Pinterest account identified as a business one. Secondly, you will get many advantages with business account that you would not get with personal one. Pinterest is always releasing many resources and educational tools which help in business. The improvements that it makes are useful for business accounts. If you do not have a personal account you will not be able to take advantage of these facilities like “Buy Now”, targeted ads, business analytics, etc. Thirdly and lastly, there is no problem is setting up a business account or converting your personal account into one. Hence, it does not hurt to get yourself a business account taht comes with added facilities. Had it been a laborious task, one would think twice before setting it up but the time it takes is less than what you spend in brewing a cup of coffee! Hence it pays and not hurts to set up a business account instead of a personal one. Let us proceed with setting up of a business specific account at Pinterest or converting an already existing personal Pinterest account into a business specific account. How to convert personal Pinterest account into one that answers your business needs. It is very easy to do. Here are the steps involved in it. You need to first go to the website business.pinterest.com and then you need to click on the red button that reads “Convert your existing account”. The nest step involves selecting “Business Type” and then updating you details like contact name or email address, if required. 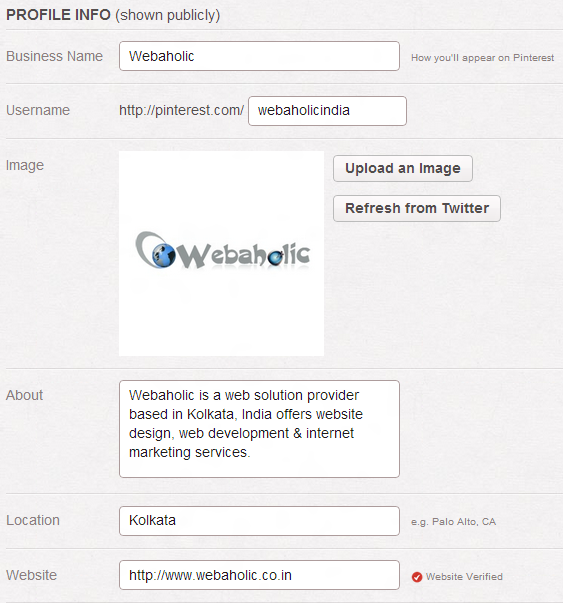 While you are one the same page, you should fill the following section which is named “Profile Info”. If you have already filled these details when you had set up your personal account, you need not fill them again. You can make changes in them if you want some modifications, though. These details will be publicly displayed as it had been in the past. Hence, it appears no differently than it did on the personal account. Now you go down to “Agreement” section. You must read the agreement before you proceed. Then you need to agree to it. After you have agreed to the agreement and accepted al the clauses, you should click on teh red button which reads “Convert Account”. After you have clicked on this button, your personal account will be changed into a business one. That’s it. Those were the few simple steps that you require to carry out to change your personal account into a business account. 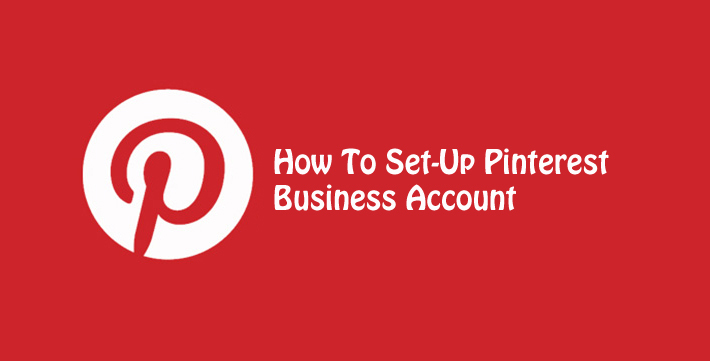 How can you set up your Pinterest business account from the scratch? What you saw before this was conversion of a personal Pinterest account into business account but what if you do not have a personal Pinterest account from before? What if you need to set up a business account from the scratch? The good news is that setting up a Pinterest business account is as easy as converting into a business account. The basic difference is that instead of clicking on the red button that read “covert your existing account” you need to click on the writings “new to Pinterest? Join as business”. The rest of the steps are just the same. After you have proceeded, the main difference will be that you will have to fill in all the details which will be blank in the “About” section. The reason for this being that your profile is brand new here. After this, there is guide to setting up the account and optimising it. Pinterest will help you get many odd jobs like adding button, verifying your website, etc done. Hope these ideas and tips that will make your journey a success.